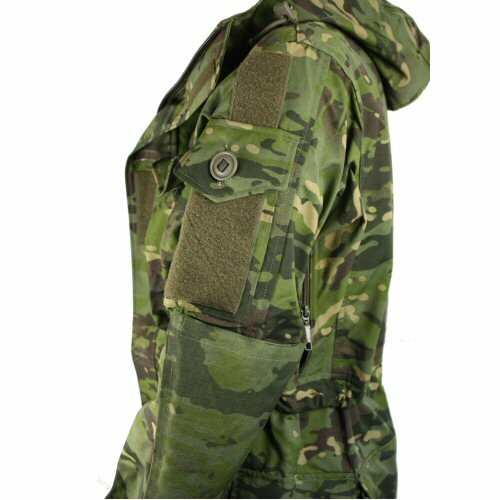 The Operator Combat Smock in Crye Tropical Multicam is a fully featured, operator designed combat jacket. 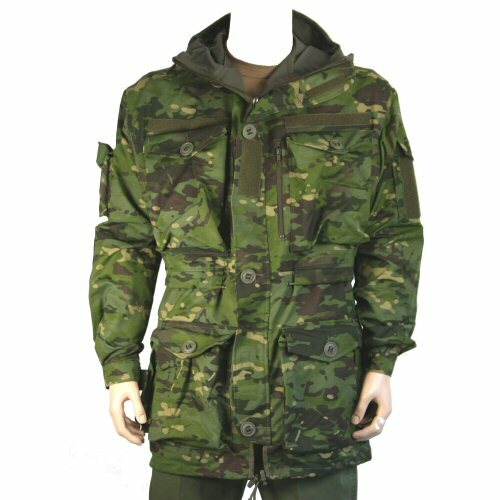 The smock is constructed from the top grades of material available in genuine Crye Tropical Multicam, such as vat dyed NYCO ripstop fabric, with reinforcements on elbows in 600D Cordura. 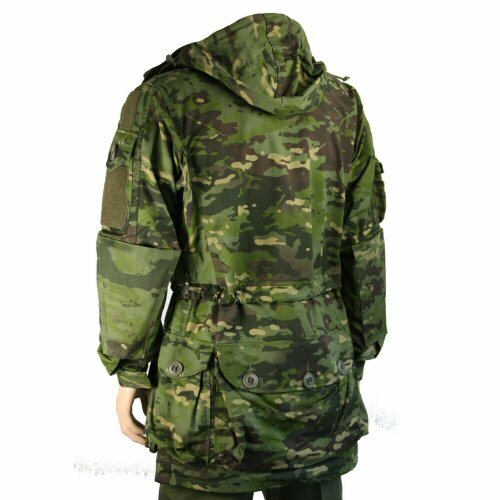 The jacket features two bulgy chest pockets, two zip up dump pockets, four bulgy waist pockets, one large bulgy seat pocket. The waist tightens with drawstring and the hem also has a drawcord for tightening around the seat to keep out draughts. The elbows are reinforced with cordura and can open to accept padding. The upper arms also have pockets; the left is a flat document or ID pocket and the right is a bulgy pocket suitable for field dressing. 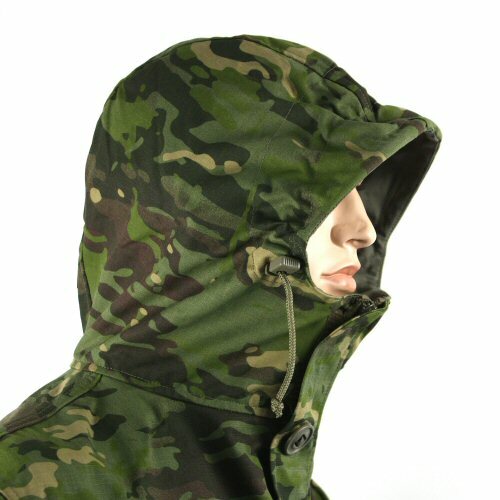 The hood has a high collar to prevent draughts from entering from the neck area. It is wired around the top and can be retained with a velcro strip on the back of the head to prevent the front from dropping over the eyes when prone . A drawstring with plastic cord retainer on either end keeps the hood tight around the head. The cuffs close with velcro. The upper arms have velcro for insignia or identification patches. Velcro name tape strips are also on the front of the jacket above the chest pockets. Long double zippers are located in the armpit areas that allow the jacket to be unzipped from either arm or side of body for ventilation. The front of the jacket has a button and velcro baffle to keep out draughts, as well as a double chunky zipper for opening the jacket. Underneath the baffle is a zip opening to allow easy access to shirt or fleece chest pockets. All buttons are 25mm diameter slotted buttons for easier operation. The lower leg has an internal baffle with its own elastic and toggle adjustment to prevent the trousers from riding over the top of the boot during movement. The bulgy cargo pockets each have their own rivetted drainage hole and close with no-loss foldover lids, secured with two large 25mm diameter tape buttons. The NYCO ripstop fabric is lighter far superior in comfort and weight to the Hampton fabric. 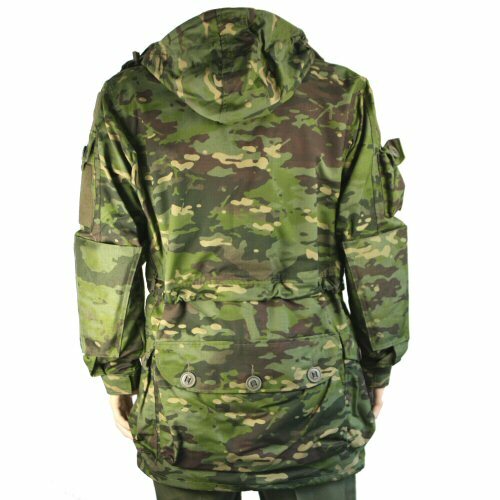 Made by German contractor to same specifications as KSK and German Special Forces smocks. Sizes are M (Euro 48-50 - 100cm chest), L (Euro 52-54 - 110cm chest and XL (Euro 56-58 - 120cm chest). Detailed view of left arm pocket, elbow reinforcement and velcro for patches. Also visible just behind the elbow is the zipper for underarm ventilation. Side angled view showing the waist gathering, hip and seat pockets. 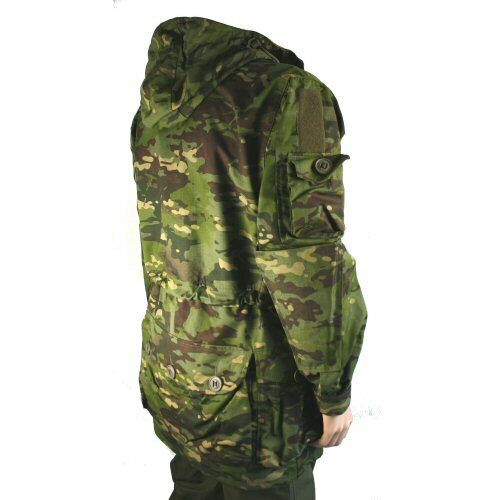 Rear view of jacket, showing both arm patches as well as the seat pocket and the hood. Angled view of right arm showing bulgy pocket, elbow reinforcement and velcro patch for shoulder insignia. Detailed view of the hood. This is shaped to provide a peak, and the peak can be shaped as it is wired. 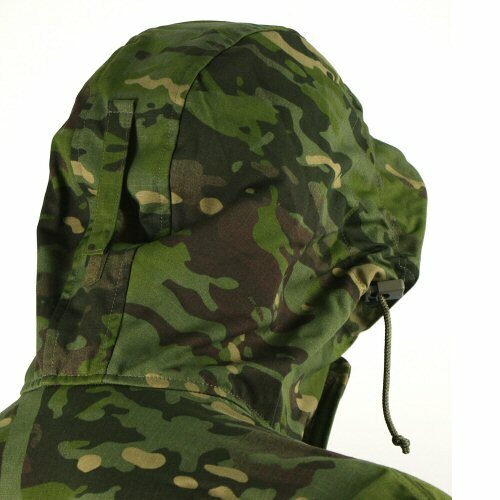 The drawcord is located behind the peak so the hood can be gathered. The collar extends right up to provide protection against draughts to the neck. A view of the hood from the rear, showing the velcro tab that can be used to keep the hood in place when lying down. 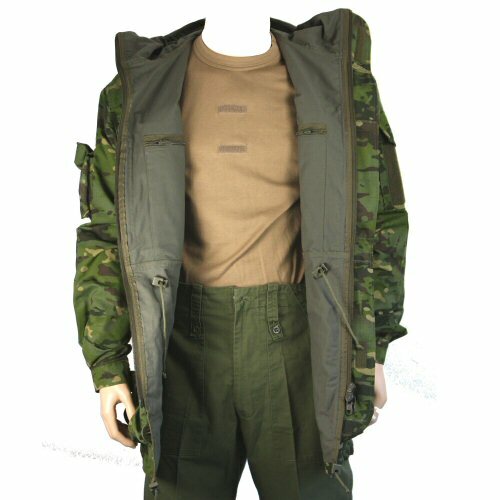 The front of the jacket is lined, and zip pockets are provided on left and right chests. The drawcord for the waist is adjusted from the inside.